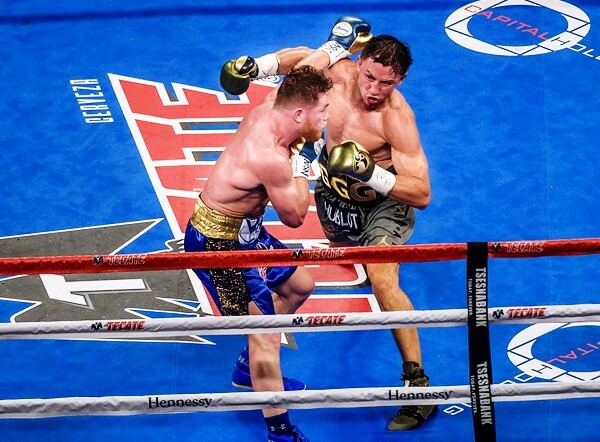 Because of Canelo Alvarez’s defensive craft and ring smarts, Golovkin never came close to scoring a knockout, but because of “GGG’s” pace, pressure, and insane durability (is there a sturdier chin in boxing? ), Alvarez was made to work when he wanted to rest, and ultimately got out-hustled by the older man. For me, Gennady Golovkin won no fewer than seven rounds. Canelo doesn’t have the stamina to work for three minutes every round, so he fights in spots, often punctuating the last thirty seconds of each stanza with a flashy, clean combination to leave a lasting impression on the judges. In this sense, Alvarez knows that it’s not necessarily the better fighter who gets the benefit of the doubt in round scoring, but the better performer. Personally, I preferred the more consistent and steady work of Golovkin, who was the better fighter last night. That’s not to say Canelo didn’t fight well, however, because he most certainly did. Defensively, he was superb. 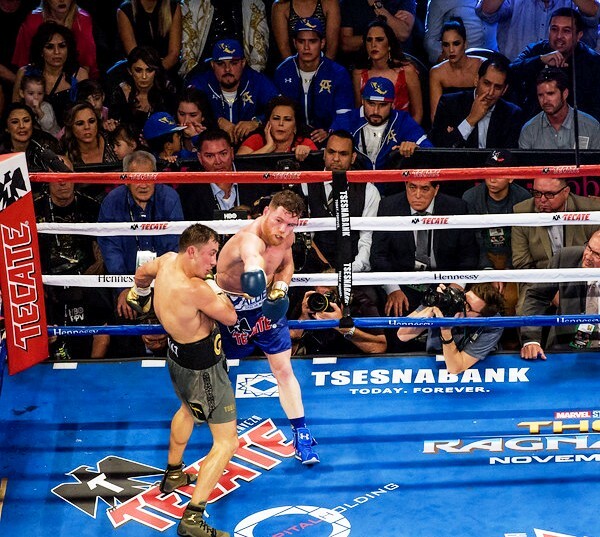 Canelo used his footwork (which I’ve long said is underrated) to offset Golovkin and avoid the Kazakh’s powerful punches numerous times, especially when he was against the ropes. For instance, Alvarez did an excellent job of making “GGG” miss with the right hand by sliding out to his left. In addition, Canelo’s slippery upper body movement kept him elusive and created some beautiful counters throughout the contest. Offensively, Canelo’s uppercuts were predictably noteworthy. Alvarez also had some success jabbing with Golovkin, and when returning fire with the jab immediately after “GGG” had fired his. With that being said, Gennady’s jab was by far the most effective punch of the fight. Canelo gave ground primarily because of it. Golovkin didn’t really use his jab to set up other punches, though. He used it mainly to disrupt and stifle Canelo, and it worked like a charm. 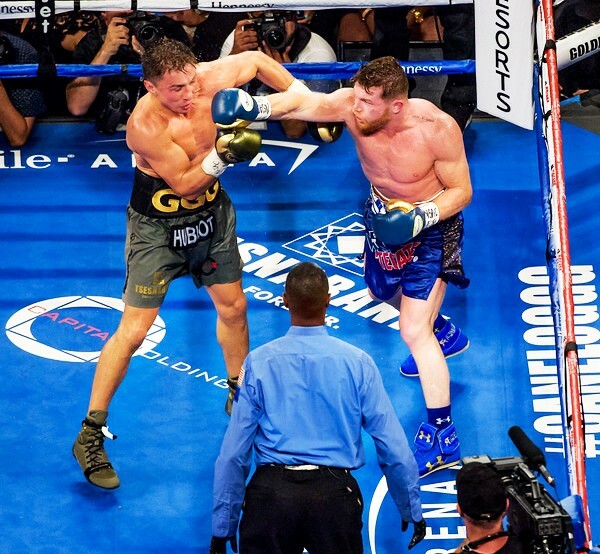 Golovkin was perhaps a little too cautious when Canelo was against the ropes, but he did well not to smother himself or overcommit to his punches, which would have accommodated Alvarez’s short, timely counters. On the whole, I felt that Golovkin neglected Canelo’s body. Maybe he was worried about leaving himself open up top? 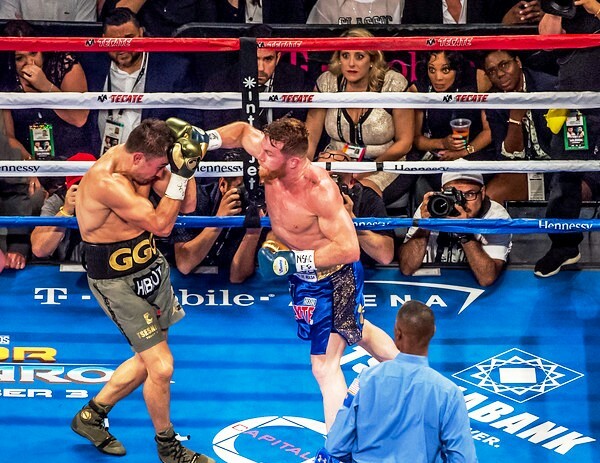 Nevertheless, when Alvarez was sliding out to his left, “GGG” should have been blocking off his exit by taking a step to the right and then throwing a sweeping right hook to the body. Instead, he threw his right hand straight at Canelo’s head, which made it easy for Alvarez to escape out the back door. If you go back and review the fight, you will see this continually. In fact, this was the first time I’ve ever watched Golovkin and thought to myself he could have done a better job of cutting off the ring. Canelo’s movement was good, but it wasn’t that good. At times “GGG” looked hesitant. Some of this was part respect for his opponent, but some of it was slippage. “GGG” is not as explosive and he no longer attacks with the same intensity and ferocity. To me, this is obvious. I’ve already touched on “GGG’s” durability, but his defense might have went overlooked. He blocked a lot of punches with his gloves and forearms, and I liked how he occasionally got behind his lead shoulder and rolled with Canelo’s right hand. Alvarez’s left hook to the body (which was arguably his key weapon heading in) was often caught on “GGG’s” right elbow, which was kept close to the body in a protective position. I also appreciated how in the later rounds, “GGG” denied Canelo the clinch by positioning his head under the Mexican’s chin and then pushing back his arms. Fair take, glad to wake up and have this to digest! Had a lot of trouble sleeping last night. A few years of watching and reading Lee’s work has had a significant influence on me. Golovkin’s inability to make an adjustment & continue throwing that looping right when Canelo would predictably pivot out of the corner again and again was extremely disappointing from a fighter that came out nervous but did almost everything else very well (focused body work also lacking). 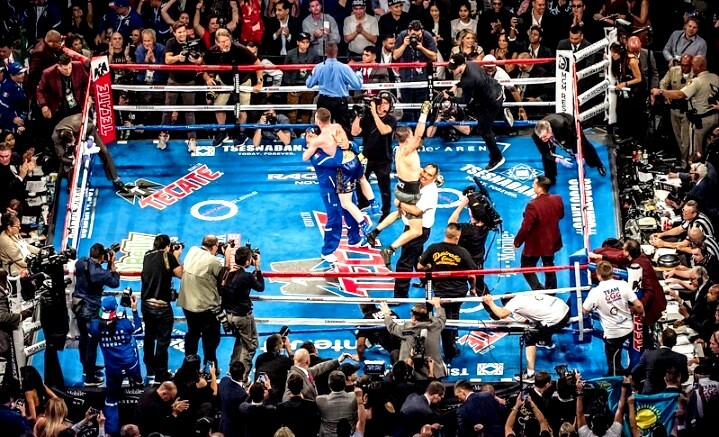 While it did put Canelo out of position as far as countering goes, GGG used up substantial energy throwing the shot & also ended up out of position while Canelo reset and conserved some energy. He made Canelo’s job easy with that. 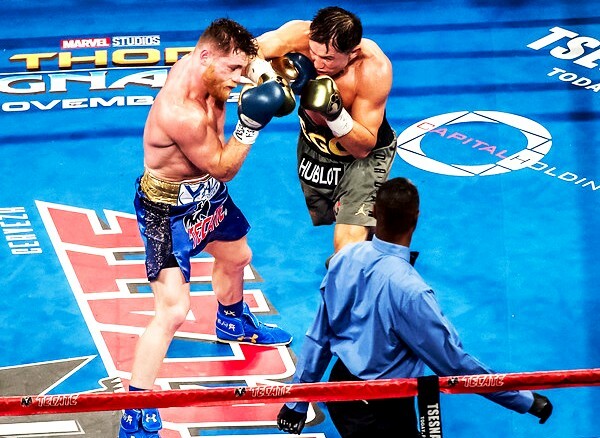 Canelo makes his best case for 3, 11 & 12 – style taken into consideration. He was always going to concede the initiative to GGG. Golovkin has to be given 5-9 without question. I’m ashamed to be from Connecticut, Don Trella. If the judges only watched 20 second of round 10 then I guess it goes to Canelo – maybe his best sequence. The other 160 seconds went to GGG. 1, 2 & 4 were rounds where I would favor GGG, 1 & 4 comfortably, Canelo did grab some momentum in the 2nd. ESPN & HBO’s usual scorers had it 116-112. Interested in reading thoughts from all of the highly educated TFC community. Are we thrilled by the prospect of a rematch next year? Intrigued sure, but I am generally feeling deflated & of the opinion the public at large will react the same as they did to Ward v Kovalev 2. With substantially less enthusiasm. You summed up most of my thoughts. I do credit Canelo for throwing GGG off his game, especially rounds 1-3. GGG simply didn’t establish himself and showed low confidence a lot in withdrawing shots, not pressing. The fact that GGG never fully dominated disappointed me but not nearly as much as Trella’s round 7. As you wrote, I’m deflated. I had Canelo winning the first 3; GGG winning the middle 6; with Canelo winning the last 3. I don’t think a draw result was that bad of an outcome. Neither fighter was decisive. I thought Canelo started to show fatigue as early as the end of round 3. Clearly, GGG was the better-conditioned fighter and took control of the ring during the middle of the fight. It was really his fight to lose going into the 10 round. Canelo surprised me with his spurt of energy in the 10th. He seemed to find a second wind and seemed to have more output in the 10th, 11th, and 12th. I don’t think many, if any, of Canelo’s punches did much damage to GGG. He does have a great chin. But likewise, GGG might have had only 4 or 5 solid connections to Canelo. Obviously, Judge Byrd’s scoring was way out of line. But I don’t think a draw was unreasonable. Very fair take. It saddens me that Wylie’s probably the only level-headed piece of read so far in media (I haven’t read other writers on Fightcity about this decision yet). With that said I think Canelo easily outboxed him. I was of the opinion that GGG, the destroyer of worlds would stop a fading Canelo in rd 8 or 9. But Canelo showed he has levels to his game. To stop the bodyshots GGG tried leaning forehead to forehead against Canelo….but he threw NOOOO punches!! This is how Holyfield frustrated Tyson but GGG did nothing from that position. I can understand the low output argument against Canelo…but you have to consider that GGG who stopped 23 men straight was supposed to put him in the hospital per boxing consensus. The fact that slow-footed Canelo took away his power is major points in Cinnamon’s favor. To me…a winner of 5000* amateur fights should have more than an ineffective jab. I disagree that that put Canelo on the ropes as one of his basic strategies is to lay on the ropes and spring uppercut and hook traps. I agree with Byrd. I was completely unimpressed with GGG and waiting for him to show up. I think you watched the same fight I did. Listening to Roy Jones Jr commentate, he said precisely that. It was Max and Jim who vocally disagreed. I took Roy’s option with higher value due to his experience in the ring. I feel that even though GGG threw more punches and landed more they were non-effective punches in comparison to Canelo. Sorry I read so late. What do you think happens in rematch? Good, reasonable and intelligent reportage from Lee as always. I had Canelo nicking the fight, no problem with those who had GGG winning narrowly or a draw. To Joe, I really can’t see how you gave G 1,2 and 4. Most rightly had Canelo winning the majority of the early rounds. Pretty sure I had him 3-1 up after 4. Cleaner, crisper work and excellent tactics. G not finding the mark enough. A rematch is a scintillating prospect. Considering Canelo was probably up by three points after the first three rounds, it’s not unreasonable to think he won three out of the remaining nine rounds. I would definitely agree Golovkin’s consistency won out in most rounds, but there were some, like the 12th, where Canelo did enough in his bursts to win the round. A draw is fine with me, so long as we see round thirteen before Golovkin’s teeth fall out and has his hip replaced. I had Canelo winning the first three and last three. I think a draw is a fair result. 115-113 either way or a draw are all acceptable results in my opinion. Canelo was simply not active enough. Great defense does not win a fight on its own, and when he did punch he was unable to vary the level of his offense and was putting too much steam in every single punch. GGG should have won 8-4. No way Canelo won first three, he didn’t do anything. And now we know he juiced, it’s even worse.